It is difficult to make out details of the spectacular Saint Thomas Church reredos, even from the closest pews. To provide more detail, I used a telephoto lens at 320 mm to capture the great detail of the statues. 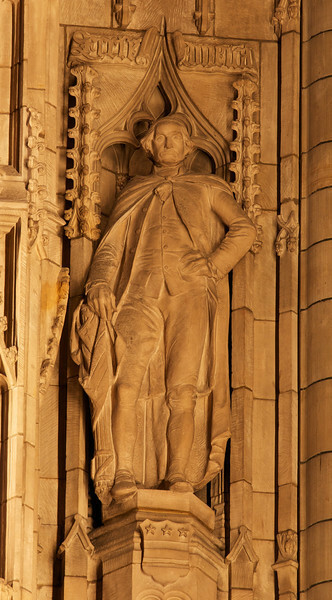 This is George Washington located in the extreme right of the reredos in the center. Bertram Grosvenor Goodhue was responsible for the theme and figures and won the American Institute of Architects’ gold medal in 1925 for this effort. Sculptor Lee Lawrie shaped the figures' appearances, reflecting the individual personalities. Goodhue designed the church with Ralph Adams Cram. The carvings were executed in Boston from Dunville stone from Downsville, Wisconsin. When illuminated, the stone assumes the cast of ivory, according to "A Walking Tour of Saint Thomas Church."